This was a heavy novel. It was full of beautiful writing, and there were glimpses of hope, but I don't think categorizing it as anything but bleak would be an honest assessment. The siege of Leningrad was a horrifying situation, and Dunmore doesn't try to glamorize or gloss over the plight of the Russians struggling to stay alive. As the book progresses, and their hold on life becomes more tenuous, the novel itself seems to slow down - to become less grounded in real events and more dreamlike. Anna's struggle to trek just a few blocks in the snow takes pages, mirroring for the reader how exhausting and terrifying it would feel to her. I sense this book could be a tough sell for some readers, but I was really drawn to its intensity. Like the best historical fiction, it served to make me more interested in reading accounts of the time in which it took place. 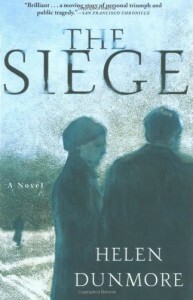 I don't know that I've ever read fiction (or nonfiction) set during this particular part of WWII, and it made me definitely interested to find more books about this siege.